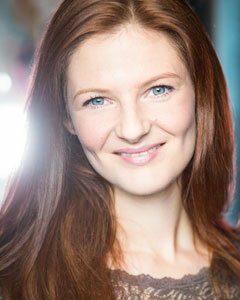 Helen trained in musical theatre at Mountview Academy in London. Helen’s professional theatre credits include: Christine Daaé in Phantom of the Opera (Ken Hill edition, Tokyu Theatre Orb); Gertrude Lawrence in the UK Tour of Noël & Gertie; Dora Bailey in Singin' In The Rain (Salisbury Playhouse, Bolton Octagon, New Vic); Roxie Hart in the award-winning Chicago (Oldham Coliseum); Joanna in Sunset Boulevard (West End and Watermill Theatre), the production was nominated for 4 Olivier Awards including Best Company Performance; creating the role of Ekaterina (originally known as Hermione) in the new Howard Goodall musical adaptation of A Winter’s Tale (Landor Theatre); Miss Dorothy in Thoroughly Modern Millie (Watermill Theatre); Chess (Princess of Wales, Toronto and UK tour) understudying and playing Florence, winner of the WhatsOnStage Award for Best Regional Production; Mercy in Carmen (Stephen Joseph Theatre); featured soloist in The Sopranos Live (European and UK tours) and Cole, a Cole Porter Revue (Yvonne Arnaud Theatre); Miranda in The Blonde Bombshells of 1943 (National Tour); The Nurse in Oh! What A Lovely War (Bolton Octagon); Jane in Salad Days (Greenwich Theatre, Devonshire Park Theatre); Pitti-Sing in Hot Mikado (Watermill Theatre); the title role in Peter Pan (Billingham Forum); The Evil Enchantress in Beauty and the Beast (Darwen Library Theatre); Gloria in Brassed Off (Oldham Coliseum); Jane in Salad Days (50th Anniversary Tour); Dorothy in Wizard of Oz (tour); title role in Cinderella (Georgian Theatre Royal, Richmond); Miss Davis in the Glenn Miller musical American Patrol (Mayflower Theatre); Carmen in FAME (Gaiety Theatre, Isle of Man). Helen also appeared in the BBC drama Capturing Mary. © Helen Power. All rights reserved.